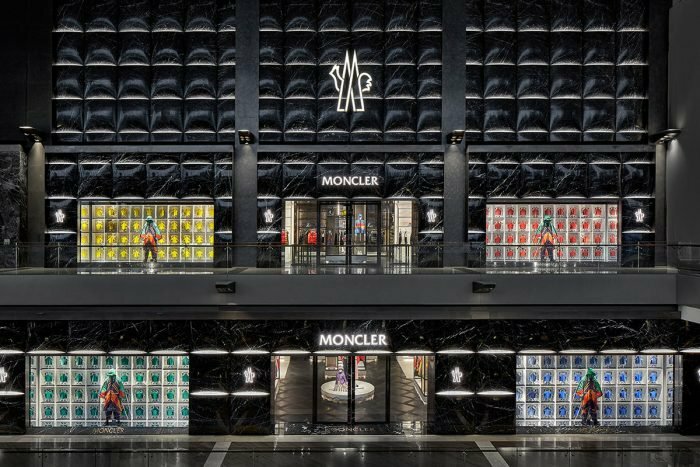 Moncler brings its French-Italian sports-luxe flair to the heart of Singapore with a glamorous new two-storey flagship store at The Shoppes at Marina Bay Sands complex. The double-storied boutique’s facade is anything but the traditional storefront. It is painstakingly carved out of black marble, curves and bulges in all the right places, a solid effort and homage to Moncler’s signature down puffer jackets. The design details do not stop at the facade. 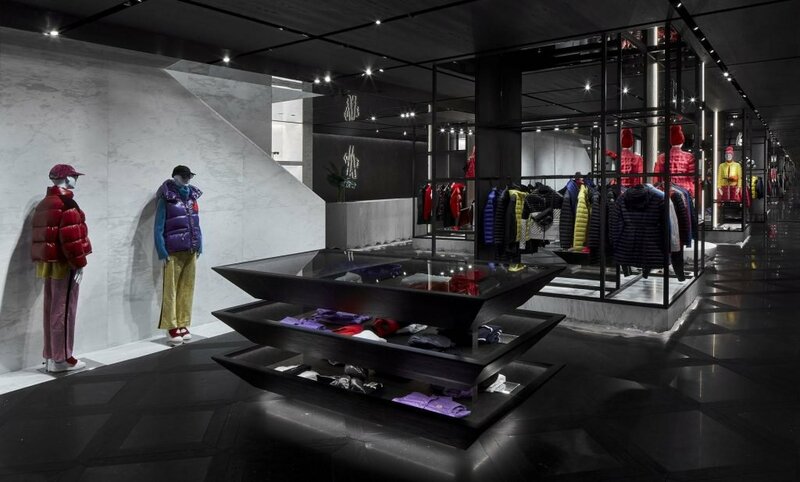 Within the store, you’ll find plenty of white marble, including the stairway, which has been entirely decked out in the material to create a sense of being, in the Alpines – where Moncler’s apparel are most useful, of course. Elsewhere, furniture are also likewise carved out of the material with a raw, ragged finishing, to mimic icebergs. A lot of attention and effort has been at play, folks, the result of a collaboration with acclaimed French designer Gwenael Nicolas. French designer and founder of the Curiosity design studio, Gwenael Nicolas, designed the interior of the shop around the idea of ice. Expressing a stark contrast, dark wood is paired with grey and white stones in tune with the elements of nature. 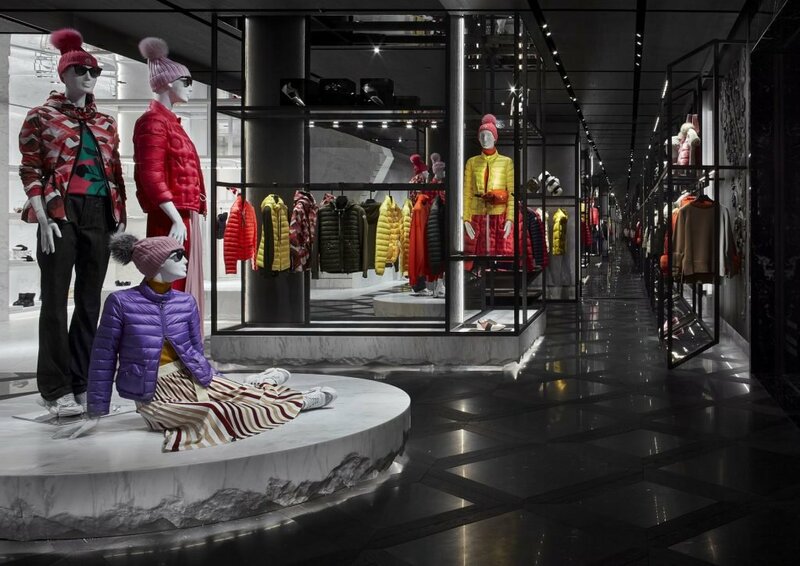 The interior design of the new space is the result of Moncler’s collaboration with Gwenael Nicolas, French designer and founder of the Curiosity design studio. A suggestive contrast for the inside is given by a dark wood and gray color palette alternated with white stones, recreating an evocative ice effect – expression of the nature’s strength and elegance – and a timeless stage for the whole product range.